Strong, healthy grass will only grow on a good foundation. Begin by digging over the whole area and remove large stones and weeds. The best type of soil for lawns is a sandy loam which is free draining enough to prevent water logging but capable of holding some moisture during dry weather. If you want to make a lawn on heavy clay or very light soil, improve it by digging in some topsoil containing plenty of organic material. Use a rake to level the ground into a perfectly flat surface, and then leave to settle for at least a week. During this time new weeds are likely to appear which must be removed. If you use a chemical weedkiller for this job be sure to use one that won’t affect the lawn grass you want to grow. Walk all over the area, treading down the soil to remove air pockets and make a smooth, hard surface. 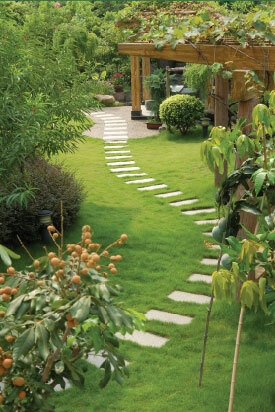 Check that there are no bumps or hollows to spoil the appearance of your new lawn. Finish by lightly raking to produce a thin layer of fine, crumbly soil. Unless the soil is very rich you might also want to add a general fertilizer. You now have two decisions to make: what type of grass do you want, and will you grow it from seed or turf? For a purely ornamental lawn fine-leaved grasses will give the best result, but coarser, tougher grasses should be included in a lawn that will need to look good and withstand some wear and tear. Grass seed is the cheaper option and is best sown in spring or early autumn. Take care to sow the seed evenly. In dry weather, water gently to keep the soil damp while the seed germinates and grows. You might also have to find ways of deterring birds from eating the seed! Turf can be laid at any time of year except when the ground is frozen. To ensure a perfect lawn, only buy top quality weed free turf from a reputable supplier. If it is laid as soon as possible after delivery, and not allowed to dry out, the grass will quickly grow new roots that anchor the turves to the ground. Once your new lawn is established you can keep it in perfect condition by raking and feeding twice a year (in spring and autumn), watering if there is a drought, and regular mowing and edge trimming. If you want a perfect lawn but haven’t the time or energy to make one – there is a much easier way! Call in a professional landscape gardener who can recommend and supply the best soil and grass to suit your garden and get your lawn off to the best possible start.